Yet another World Champion with something to say! America's Hall-of-Fame chess legend GM Bobby Fischer has just delivered the latest of his scathing interviews detailing elaborate conspiracies, international politics, and graft among the chess elite. This exclusive interview was conducted on 27 January 2002 by Helgi Helgasson together with Sæmundur Pálsson from a radio station in Reykjavik, Iceland. Pálsson was Fischer's body guard and close friend during the now-famous 1972 Fischer-Spassky match. 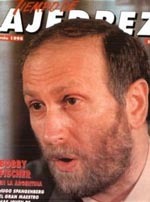 In 1992, Bobby Fischer was indicted for violating a government ban on travel to Yugoslavia. Fischer traveled to war-torn Yugoslavia for a rematch against the Russian-turned Frenchman GM Boris Spassky in 1992. At that time, the U.S. was engaged in NATO operations against Serbia. After a federal indictment and the suspension of his passport, millions of dollars of his personal property (including a medal from the 1972 match) were apparently confiscated. While explaining this case, Fischer interspersed his delivery with quotations from the 5th and 14th Amendments of the U.S. Constitution which mentions the protection of private property. GM Fischer, who has shuttled between Hungary, Germany, Japan, and the Philippines, spoke on the issue of lost revenues from a number of chess materials bearing his name. This included the famous book, "Bobby Fischer Teaches Chess," and the popular movie, "Searching for Bobby Fischer." At a couple of points, Fischer had to be warned for his excessive profanity. However, one of the most shocking accusations during the interview was his description of "pre-arranged" matches by today's elite players. He claims the latest of such was the recent Kasparov-Kramnik match which he described as "beautiful chess," but totally prearranged. He discussed the intriguing idea of "Fischer Random" which is designed to put an end to what he claims as rampant "cheating" among today's elite players. Fischer Random features 960 possible starting positions generated by a computer which predetermines the positioning of the pieces on the first rank. The same rules apply with a variation in castling. When asked about a return, he stated that he only plays "Fischer Random," but would entertain a match with a leading player. Fischer claims conventional chess is "rotten to the core!" Note: Discretion is advised when listening to the interview. Contains very strong language and may be offensive to some.